You’ve worked hard to get your company or product editorial coverage. Don’t stop there! 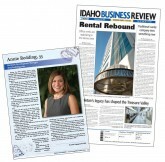 Being featured on the pages of Idaho Business Review is an accomplishment. But it’s only the beginning. Marketing campaigns benefit not only from the strength of published work – but from the power of credibility. Reprints allow you to take your editorial coverage from an industry respected publication and optimize it for marketing purposes. Communicating with reprints, whether hard copy or electronic, adds credibility to your message and helps brand your achievements. Reprints help you extend the life and value of your press and leverage it for extended and targeted use. Advertisements and other articles that originally appeared on the page are taken out and reformatted. The top of page will feature the Idaho Business Review masthead or any one of our specials publications logos such as Women of the Year, Accomplished Under 40, Leaders in Law, or Excellence in Finance. IBR offers this versatile option for clients seeking a “one-size-fits all” product. It can be posted on your website, sent out in e-mails or used to print your own copies. Plus, it can be customized with logos or photos. Custom framed reprints that commemorate your achievements are the perfect complement to reprints used every day in your business. Frames masterfully house your reprints for display in your office, reception area or home. The cover of the special publication such as Women of the Year, Accomplished Under 40, or CEO of Influence will appear alongside the exact replica of the article published in the pages of the Idaho Business Review. Mount your feature in a beautiful 22″ X 15″ frame.